An introductory, urban-based adventure set within the high-powered fantasy world of Eberron. A review copy of “Sharn: The Missing Schema” was provided by the publisher. Find more DMs Guild Reviews on my website and YouTube channel. As awesome as Dungeons & Dragons Fifth Edition has been, Wizards has relied almost exclusively on the Forgotten Realms setting. This has the advantage of creating an ongoing, shared universe that people have come to associate with D&D, but at the expense of many of their other worlds, including Eberon. Eberron was created around 3rd edition as a hyper-magical, technologically advanced fantasy world. Think arcane steampunk, with magic trains and sentient golems. It was explored again in Fourth Edition, but sadly, as with other fantasy worlds, it has been noticeably absent from any official support in Fifth Edition. 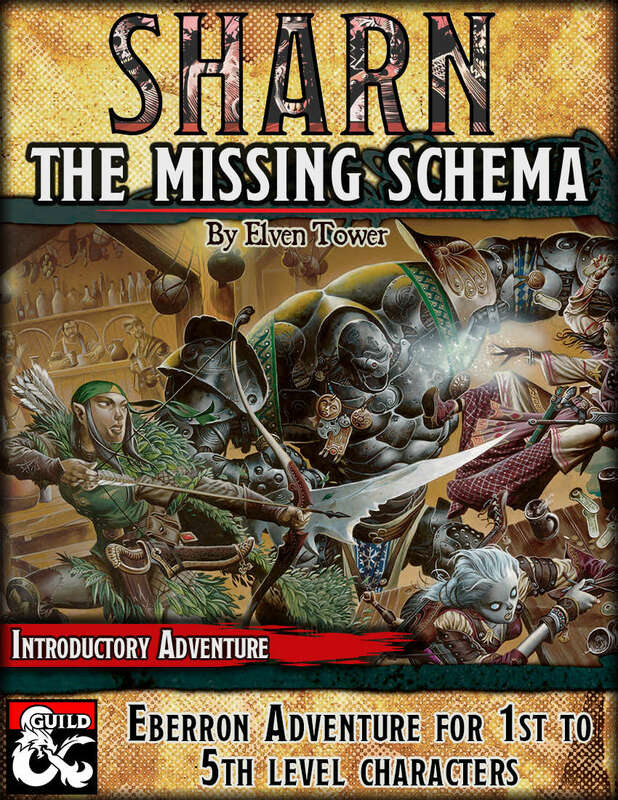 “Sharn: The Missing Schema” is an introductory adventure for levels 1-5 built around Eberron, specifically the city of Sharn. It serves as an excellent starting point for this intriguing fantasy universe while providing a classic, action-packed adventure that nicely shows off Eberron’s unique flavors. Part 1 introduces the players to each other, the city of Sharn, and their quest-giver, Professor Daela. Daela has a simple task: retrieve a schema (a magical blueprint) from the sewer depths of Sharn. It’s the kind of paid dirty work suitable for low-level adventurers. In Part 2 the PCs journey into the underground depths of Sharn. They meet a wolf shifter who attempts to extort, then ambush them with his buddies, then a warforged who was sent before to retrieve the schema but unable to bypass the door to the ancient laboratory. The laboratory servers as mini-dungeon crawl with some rats and mechanical security measures the party will need to defeat to claim their prize. Part 3 offers an interesting twist to the rote mission. Upon turning in the schema and collecting their reward, the PCs witness a group of thieves stealing the Schema, stabbing the Professor, and fleeing the scene. 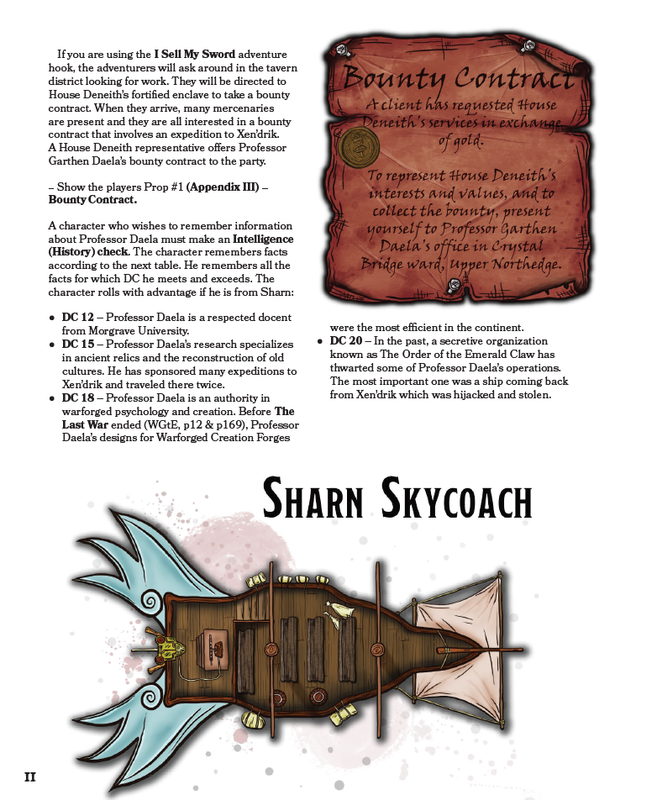 The party can catch up by hopping aboard a skyraft and soarsleds, creating an exciting airborne chase sequence over the vertically-themed city of Sharn. It’s a tricky situation to handle, and unlike the other sections, there isn’t a map to use. But there are notes on how to run the encounter, including a nifty d20 list of possible outcomes for falling party members. I would’ve preferred a bit more structure and framework, however. Part 4 begins when the chase ends at a warehouse. For higher level parties, or those that had a streak of luck in the adventure so far, there’s an option to charge right in, dodging ballista shots and making a hell of an entrance. Otherwise the adventure encourages a chance to rest up and infiltrate the warehouse on foot. The warehouse is basically just one big room with the final battle, although the boss of the Emerald Claw thieves, Arthemis, is talkative and attempts to persuade the PCs to his side. Unfortunately there aren’t any notes if a particularly chaotic party actually takes him up on the offer. As a low-level urban adventure, “Sharn: The Missing Schema” doesn’t go much beyond a classic MacGuffin set-up, but I do enjoy the shock in the middle when you think the adventure is over, only to end up in an airborne chase sequence. It’s extremely well made, with fantastic maps and artwork throughout, and represents a solid introduction to Eberron and the uniquely vertical city of Sharn. Excellent background information and lore on the city of Sharn. Variable informational rewards based on different DC skill checks. Excellent formatting and use of art, maps, handouts, and flavor text. Adjustable encounters for level 1-5. Vehicle chase in the sky! Joining the villain at the end is a neat option but it results in no final boss fight, and an aftermath that isn’t covered in the scope of this adventure. Part 3 (Flying Chase) could use a bit more clarity and structure in its design. The Verdict: Straight-forward and easy to run, “Sharn: The Missing Schema” is the perfect introductory urban-based adventure into the world of Eberron. Next Next post: New weekly Let’s Play live series!